External References Palette was introduced in AutoCAD 2007 with some changes as can be seen below. To open the External References Palette use the commands XR, XREF, EXTERNALREFERENCES or Tools>Palettes>External References or use the button on the Reference toolbar. To close use the command EXTERNALREFERENCESCLOSE. You might see it referred to as Xref ESW where ESW stands for Enhanced Secondary Window. You can have it open all the time docked or anchored. It handles DWG, Images and DWF. Later Microstation DGN file format will be added. If you use DGN files there it is an Autodesk DGNV8 Translator Beta available at http://labs.autodesk.com/. Image extensions *.cals and *.pict are added as accepted. Insert>External References to open the Xref ESW. In the External References palette, select a DWG reference name. Edit the xref path directly. Click Browse. Select the xref in its new path. Use CUI to change the behavior of the Xref ESW in relation to your workspace. 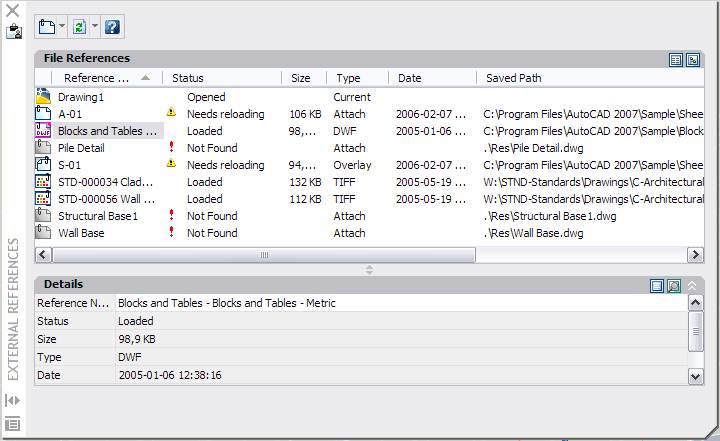 CLASSICXREF is a command that displays the Xref Manager with the old GUI. CLASSICIMAGE is a command that displays the Image Manager with the old GUI. ERSTATE is used to get the External References palette State. XREFCTL controls whether external reference log (XLG) files are created. The log file is an ordinary ASCII text file with the same name as the current drawing and the file extension .xlg. If you load a drawing with the file name sample.dwg, for example, the program searches for a log file named sample.xlg in the current folder. If the file does not exist, a new file is created with that name. Once a log file has been created for a drawing, the program continues to append information to it. The program writes a title block to the log file each time the file is opened. If the log file becomes too large, you can delete it. XREFNOTIFY that controls the notification for updated or missing xrefs. The value is saved per user and profile. 1 - Enables xref notification. Notifies you that xrefs are attached to the current drawing by displaying the xref icon in the lower-right corner of the application window (the notification area of the status bar tray). When you open a drawing, alerts you to missing xrefs by displaying the xref icon with a yellow alert symbol (!). 2 - (default value) Enables xref notification and balloon messages. Displays the xref icon as in 1 above. Also displays balloon messages in the same area when xrefs are modified. The number of minutes between checking for modified xrefs is controlled by the system registry variable XNOTIFYTIME. XREFTYPE controls the default reference type when attaching or overlaying an external reference. It is saved when changing the reference type using the XATTACH command.